Place all the ingredients in a food processor/blender and puree to make a homogeneous sauce. Set aside the sauce. Cook the noodles according to the instructions on the packet, drain. Place the broccoli florets on a baking tray lined with baking paper, drizzle with olive oil, season. Bake for approx. 15-20 mins. in the centre of an oven preheated to 180°C. Remove from the oven, leave to cool. 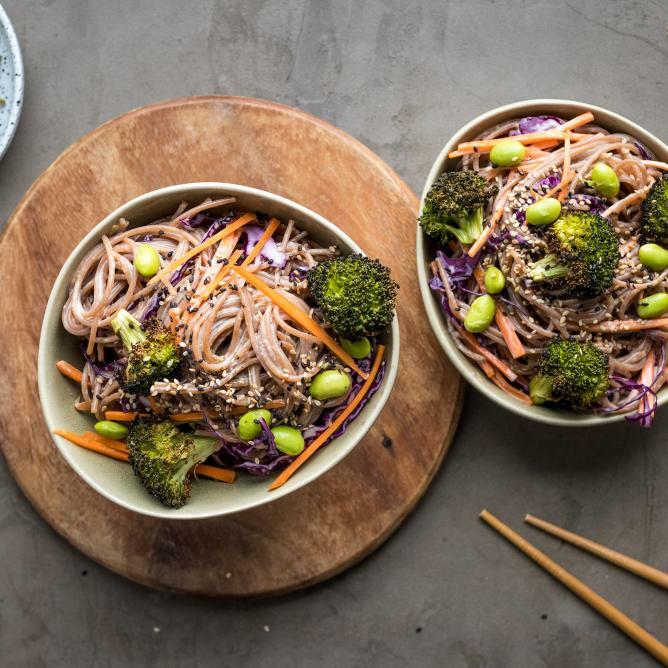 Mix the noodles with the broccoli, carrots, red cabbage and edamame beans. Add the reserved sauce, mix well. Plate up the salad, sprinkle with sesame seeds.